Israeli troops have killed 45 Palestinians since the demonstrations began on March 30, according to Palestinian health officials, while no Israeli casualties have been reported. Palestinian protesters run to cover from teargas fired by Israeli soldiers during clashes with Israeli troops along Gaza’s border with Israel, east of Khan Younis, Gaza Strip, Friday, April 6, 2018. Israeli gunfire wounded at least 28 Palestinians along the Gaza border on Monday, medics said, and protesters streamed to the frontier for the climax of a six-week demonstration as the United States prepared to open its embassy in Jerusalem. Protests were expected to escalate during the day, the 70th anniversary of Israel’s founding, as loudspeakers on Gaza mosques urged Palestinians to join the so-called “Great March of Return”. Israeli troops have killed 45 Palestinians since the demonstrations began on March 30, according to Palestinian health officials, while no Israeli casualties have been reported. The death toll has drawn international criticism, but the United States, which has drawn Arab anger by relocating its embassy to Jerusalem from Tel Aviv, has echoed Israel in accusing Gaza’s ruling Hamas movement of instigating violence. Sending reinforcements to the Gaza border, the Israeli military dropped leaflets into the enclave on Monday, warning Palestinians “not to serve as a tool of Hamas” or approach or damage Israel’s frontier fence. But thousands of Palestinians massed at five locations along the line, and at least 28, including two local journalists, were wounded by Israeli gunfire, the Palestinian Red Crescent said. The protests are scheduled to culminate on Tuesday, the day Palestinians mourn as the “Nakba” or “Catastrophe” when, in 1948, hundreds of thousands of them were driven out of their homes. The Israeli military says its troops are defending the border and firing in accordance with the rules of engagement. Palestinian witnesses said Israeli aircraft also dropped flammable material on Monday to burn tyres that protesters had stacked in preparation for them to be set on fire and rolled at the fence. 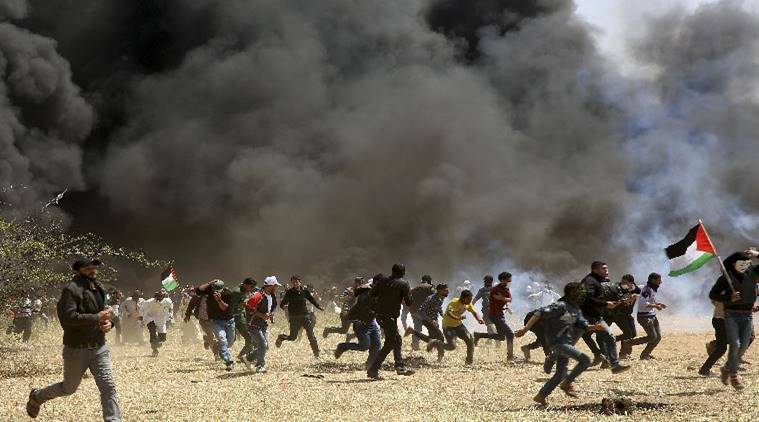 The Israelis also fired tear gas at people inside the tented encampments that have sprung up along the border, witnesses said. Naftali Bennett, Israel’s education minister, told Israel Radio that Israel would treat the Gaza fence as an “Iron Wall” and anyone who approached it as a “terrorist”.